The aim of theoretical physics is a mathematical description of the processes taking place in Nature. Science is empirical, meaning that its predictions need to comply with experimental results, but other categories are very important (but not decisive): Theoreticians look for elegance, consistency and simplicity in their descriptions, they aim for abstraction and unification, and look for reduction of the laws of Nature to a few fundamental principles and at the same time for analogies in the description of different phenomena. The subject of this article is to show how these aspects are realized in classical physics, although many of the arguments apply to relativistic physics as well - or only show their true meaning in this context. I do apologize for some of the mathematics, and I promise to keep it as compact as possible. Physical laws are formulated with differential equations, which relate the rate of change of a quantity to others, for instance the rate of change of the position with time to the velocity. This rate of change is called a derivative. The solution to these equations usually involve an initial value of a quantity under consideration, and compute the value at each instant in solving the equation. The fact that the laws of physics are formulated with differential equations is very advantageous because they separate the problems of evolution of physical systems from the choice of initial conditions for the evolution. Using differential equation for e.g. deriving the motion of planets leads to the abstraction to what forces planets are subjected and how they move under these forces. It predicts naturally the orbits of planets without fixing a priori the orbits themselves, as for example Johannes Kepler might have thought. Let’s discuss a straightforward example: The motion of a body under the action of a force in Newtonian dynamics. Newton formulated an equation of motion for this problem, which stipulates that the acceleration of a body is equal to the force acting on it, divided by the mass of the body. If, in addition, the acceleration is defined as the rate of change of velocity with time and the velocity as the rate of change of position with time, we get the usual form of Newton’s equation of motion: The second derivative of position is equal to the force divided by mass: This is the prototype of a differential equation. It does not fix the trajectory of the body (the position of the object as a function of time) but leaves that open as a solution to the differential equation under specified initial conditions (the position of the object at the starting time). Already in Newton’s equation of motion there are two very interesting details. Firstly, the solution to the equation without any force is found to be one with a constant velocity, or with a linearly increasing coordinate, which is known as inertial motion. And secondly, the equation of motion is a second order differential equation, because of the double time derivative. This has the important consequence that motion is invariant if time moved backwards instead of forwards. A generalisation to this idea is the classical description of gravity. In a very similar way, the gravitational potential is linked through a second-order differential equation to the source of that field, i.e. a central mass. How would this work by analogy? In the mechanics example above, the source of motion was given by the force and both were linked by the second derivatives. Here, the second derivatives of the potential are linked to the sourcing mass again by a second order differential equation, which in this context is called the Poisson-equation, named after the mathematician Denis Poisson. Would this idea work in any number of dimensions? It turns out that one needs at least three dimensions to have a field linked to the source by a second-order differential equation, if the field is required to vanish at large distances from the source and if the field is symmetric around its source, which are all very sensible requirements. Surely the gravitational field generated by a point mass would be the same in every direction and the attracting effect of the gravitational field should decrease with increasing distance. Is there an analogy to the forward-backward-symmetry of Newton’s equation of motion? The field equation is invariant if one interchanges the coordinates by their mirror image, therefore, Nature does not distinguish between left and right in fields, and not between forwards and backwards in motion. These are called invariances, in particular the invariance of the laws under time-reversal and parity-inversion. And finally, there’s an analogy to inertial motion, because no gravitational field is sourced in the absence of a massive object. The mass is the origin of the field in the same way as force is the reason for motion. Joseph Louis Lagrange discovered a new way of formulating physical laws, which is very attractive from a physical point of view and which is easily generalizable to all fields of physics. How it works can be seen in a very nice analogy, which is Fermat’s principle for the propagation of light in optics. Clearly, light rays follow paths that are determined by the laws of refraction, and computing a light path using Snell’s law is very similar to using Newton’s equation of motion: At each instant one computes the rate of change of direction, which is dictated by the refractive index of the medium in the same way as the rate of change of velocity is given by the force (divided by mass). But Fermat formulated this very differently: Among all possible paths leading from the initial to the final point light chooses the fastest path. This formulation sounds weird and immediately poses a number of questions: How would the light know? Does it try out these paths? How would the light ray compare different paths? It is apparent that Fermat’s formulation is conceptually not easy to understand but one can show that it leads to exactly the right equation of motion for the light ray. Lagrange’s idea was to construct an abstract function in analogy to the travel time of the light ray, and to measure a quantity called action. Starting from his action he could find a physically correct equation of motion by constructing a path that minimizes the action, in complete analogy to Fermat’s principle. Lagrange found out that if one starts in his abstract function with squares of first derivatives of the dynamical quantities, they would automatically lead to second order equations of motions, so the basic parity and time-reversal symmetries are fulfilled. In addition he discovered, that if he based his abstract function on quantities that are identical to all observers, he could incorporate a relativity principle and make a true statement about a physical system independent from the choice of an observer. The formulation of the laws of physics with differential equations is very attractive because it allows to describe different solutions that might exist for a physical problem. For the motion of the planets around the Sun there is a universal mathematical description, and the planetary orbits themselves only differ by choosing different initial conditions for the differential equation. There is, however, yet another feature present in the equation of motion or the field equation, which is related to Lagrange’s abstract description. Clearly, any description of a process must be independent if the length-, time- and mass-scales involved are changed: This feature is referred to as universality or mechanical similarity, because it allows to map solutions to the equation of motion onto others. For instance, the orbit of Mercury would be a scaled version of the orbit of Neptune, the orbits can be mapped onto each other by a redefinition of the length- and time-scales involved. This was considered be an essential property of the laws of physics, because it implies that problems fall into certain universality classes and that there is no limit of validity of the solution. Coming back to the problem of the motion of objects in gravitational fields one finds Kepler’s third law, which states that whatever the orbit of a planet, the ratio between the third power of the orbital radius divided by the orbital time squared is always a constant. It is completely sufficient to solve the problem of an orbiting planet in principle, the orbits of other planets do not even require solving the differential equation again (with different initial conditions), but all possible solutions follow from a simple scaling operation. A more comical example are astronauts walking on the surface of the moon with much smaller gravity: their movements appears to be in slow motion, but speeding up the playback would show them to move perfectly normal. The last question is of course what the true meaning of Lagrange’s abstract function should be: It is very successful in deriving physically viable equations of motion and field equations, but before the advent of relativity it was unclear how it should be interpreted: It turns out that the Lagrange-function of moving objects is the proper time and that the Lagrange-function of the gravitational field is the spacetime curvature. Objects move along trajectories that minimize the proper time elapsing on a clock moving with that object, and the gravitational field is determined as the minimal curvature compatible with a source of the field. These interpretations require that spacetime has at least four dimensions (instead of three), and they lead to viable second-order differential equations respecting time-reversal and parity-invariance. Both quantities, proper time and curvature, are invariant under changes of the reference frame, so relativity is respected, and are invariant under choosing new coordinates - this is in fact the expression of universality. And one has learned one additional thing, which must appear beautiful to everybody: The laws of Nature are geometric, a very complicated, position dependent geometry, whose properties are defined through differential equations. The lines of least proper time are straight in spacetime in the absence of a force, and considering gravitational fields in cosmology it is even the case that the expansion of space is constant an empty universe, both as a reflection of inertial motion. But there is one new phenomenon: Gravitational fields do not vanish at large distances as Newton thought, rather, they start increasing at distances above 10^25 meters, where gravity becomes repulsive under the action of the cosmological constant, and this feature brakes scale invariance. The formulation of the laws of Nature led physicists to a geometric description of physical processes in the form of differential equations, and variational principles are a very elegant way of formulating the origin of equations of motion and field equations. The true meaning of the variational principles only became apparent with the advent of relativity. It is even the case that other forces, like electromagnetism, the strong and the weak nuclear force have a analogous description, involving an abstract geometry on their own. Finally, it was realised by Richard Feynman that the way in which Nature realizes variational principles was through the wave-particle duality of quantum mechanics - but that is really the topic of another article. 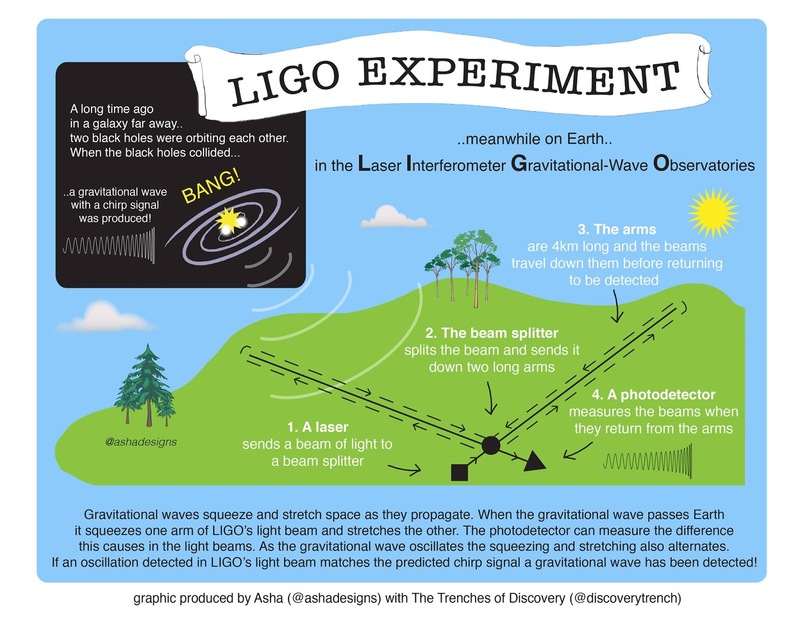 LIGO's search for gravitational waves. Here is an infographic showing how LIGO searches for gravitational waves. We're happy for it to be shared, so long as it is attributed to @ashadesigns and The Trenches of Discovery. Observationally, there's no disputing the existence of dark energy in the restricted sense of providing a good observational fit to several of the main cosmological observational datasets, modulo a rather unrealistic assumption of the model used in the fitting procedure. The assumption is that the class of possible spacetimes, i.e., solutions of the Einstein equation of general relativity, is the FLRW (Friedmann-Lemaître-Robertson-Walker) family. The FLRW models require that after choosing a way to split up space and time (a foliation), the spatial slice (i.e., a 3-dimensional space) is homogeneous—the density is the same everywhere, so galaxies and voids cannot exist. In fact, cosmologists usually make a hack, modelling galaxies and voids by patching Newtonian gravity into an Einstein "background"—since using the Einstein equation is more tricky. This hack bypasses the basic problem without solving it. Since in reality, galaxies, clusters of galaxies, the cosmic web and voids and supervoids exist beyond any reasonable doubt, the FLRW family should be expected to go wrong at recent epochs and at small (less than a few gigaparsecs) scales. And the small-scale, recent epoch is the only epoch at which a non-zero cosmological constant (or dark energy parameter ΩΛ) can (at present) be observationally distinguished from a zero cosmological constant. So it happens that just where and when we can expect things to go wrong with FLRW, ΩΛ suddenly appears, provided that we assume FLRW in our interpretation of the data despite expecting FLRW to be wrong! What is it that goes wrong? 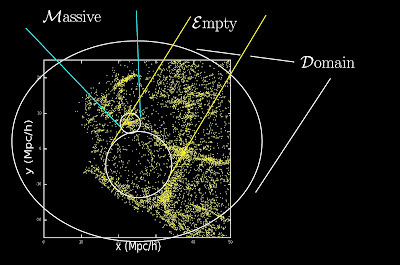 The picture above shows voids on the scales of a few tens of megaparsecs from the2dFGRS. 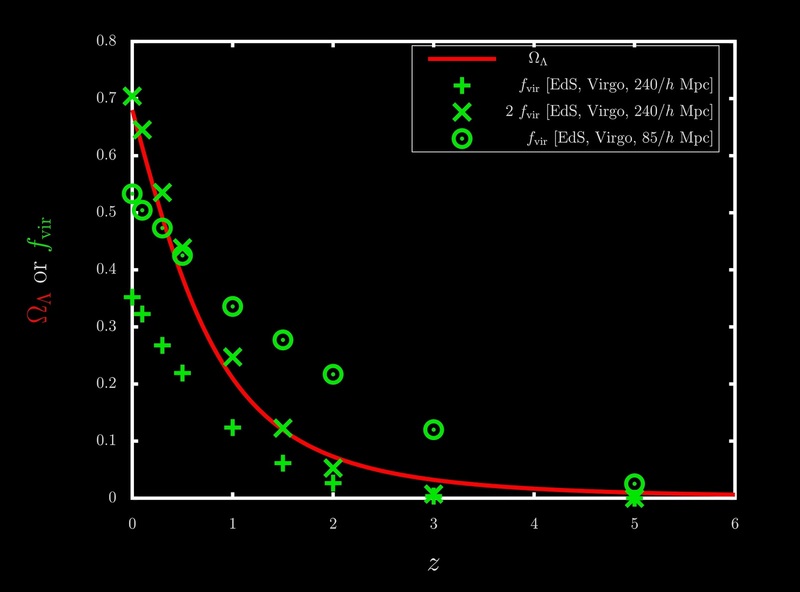 From a relativistic space point of view, expansion rates are different in different regions. This also happens in the hack of adding Newtonian galaxy and void formation to Einsteinian expansion, but in that case the expansion is forced to be rigid, by assumption, preventing the Einstein equation from being applied correctly. Even when we interpret the observations from a rigid comoving space point of view, the numbers show that the ratio of the "peculiar velocities" of galaxies coming out of voids to the sizes of the voids is big: several hundred km/s divided by something like 10 Mpc, giving a few times 10 km/s/Mpc. This void peculiar expansion rate is not much smaller than the Hubble constant, which is about 70 km/s/Mpc. At an order of magnitude level, the expansion rate is definitely inhomogeneous. This is why interpreting the observations in terms of homogeneous expansion gives a big error. In other words, unless we use a relativistic cosmological model that takes inhomogeneous curvature and virialisation into account, we cannot claim that the "detected" ΩΛ is anything other than a structure formation parameter of a fit through cosmological data using an oversimplified fitting function. The second picture at the right shows that going from right (early times) to left (today), the amount of inhomogeneity (the virialisation fraction) grows from almost nothing to a big fraction of the total mass density today. Alternatively, if we ignore the growth in inhomogeneity, then we get ΩΛ, interpreted from the data assuming homogeneity, growing from almost nothing to a big fraction (70%) of the total density today. If we ignore inhomogeneity, then miraculously dark energy appears instead! It’s an exciting time to be a biologist! Every few years it seems like there is another significant technical breakthrough that allows biological research either to speed up exponentially, or to enter into areas that were previously inaccessible. In just the last decade or so we’ve seen the publication and digitisation of the human genome (without which most current life sciences work would be either impossible or impractical), the development of super-resolution microscopy (allowing us for the first time to see live biological processes on a truly molecular scale), the facilitation of DNA sequencing (making it economical on a large scale), and the invention or improvement of a whole range of technologies (enzyme-conjugation systems, flow cytometry, fluorescence-activated cell sorting etc.) that won’t mean much to anyone outside the field but that have revolutionised the way research is done. It’s been a long road, but it finally seems like the ambitions of researchers are starting to be matched by the available technology, whether it be computational, mechanical, chemical, or biological. The latest innovation that is taking the biology world by storm is the enormous progress that has recently been made in an area that has incalculable potential in both academic and clinical contexts: genome editing. In this post I will try to explain these recent advancements, why researchers are excited, and why you should be too! 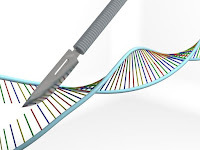 Genome editing is pretty much what you’d expect from the name; editing the DNA sequence within the genome of a particular cell. This can involve adding DNA, removing DNA, swapping some DNA for other DNA, or moving DNA around within the genome. It is difficult to overstate how powerful a tool genome editing can be when it comes to biological research. Much of the work done in molecular life sciences is trying to work out how various molecules fit into the whole machine that is an organism – genome editing allows researchers to directly tinker with these molecules (typically proteins, which are of course encoded by a their associated DNA sequence) and observe the effects. This could involve removing the gene encoding a given protein from an organism and seeing what defects arise. Alternatively, you could introduce a specific mutation in a gene to see if that has functional relevance, or introduce DNA encoding fluorescent marker proteins into the end of your protein of interest to see where it goes and what it’s up to. Genome editing elevates researchers from the level of pure observers into direct manipulators of a system. Hypothesis: The future of peer review? If I could recreate the way research results are quality checked and revealed to the world, I would probably change almost all of what is currently done. I think the isolated scientific paper is a product of the 20th century, being imposed on the 21st purely because of inertia. A better solution would be to give a "living paper" to each general research project an individual researcher has. This living paper can then be updated as results change/improve. In such a system I would probably have ~5 living papers so far in my career, instead of ~20 old-style papers. Or, even better, would be a large wiki edited, annotated, moderated and discussed by the science community as knowledge is gained. Even if you to wish to keep "the paper" as how science is presented, I think that the journal system, while invaluable in the 20th century, also exists in the 21st century only due to inertia. Pre-print servers like the arXiv are already taking care of the distribution of the papers, and the peer review, which is responsible for the quality check side of things, can (and might?) be organised collectively by the community on top of that. But why should we stick with peer review anyway? Could there be a better way? Firstly, let me stress, peer review is definitely an incredibly effective way to progress knowledge accurately and rapidly. The best ideas are the ones that withstand scrutiny. The better an idea is, the more scrutiny it can withstand. Therefore, holding every idea up to as much scrutiny as possible is the best way to proceed. However, by peer review I simply mean criticism and discussion by the rest of the scientific community. I think the way peer review is currently done, at least what people normally mean by "peer review" is very nearly worthless (and when you factor in the time required to review and respond to review, as well as the money spent facilitating it I'd be tempted to claim that it has a negative impact on research overall). The real peer review is what happens in informal discussions: via emails, at conferences, over coffee, in the corridor, on facebook, in other papers, etc. The main benefit the current method of peer review has is simply that the threat of peer review forces people to work harder to write good papers. If you removed that threat, without replacing it with something else, then over time people would get lazy and paper quality would degrade, probably quite a lot. But that would only happen if the 20th century form of peer review was removed without replacing it with something from the 21st century. I wrote above that the real form of peer review happens through conversations at conferences, in emails, etc. The rapid access to papers that we get now makes this possible. In the early-mid 20th century, because the (expensive) telephone was the only way to rapidly communicate with anyone outside your own institute, word of mouth would spread slowly. Therefore some a priori tick was needed, that confirmed the quality of a paper, before it was distributed; hence peer review. But now communication can and does happen much more rapidly. Today, if a paper in your field is good, people talk about it. This gets discussed in emails amongst collaborators, which then disperses into departmental journal clubs and the information about the quality of the paper is disseminated like that. It's worth emphasising that, at least in high energy physics and cosmology, this often happens long before the paper is technically "published" via the slow, conventional peer-review. However, this information probably still doesn't disseminate as widely or as quickly as might be ideal, given the tools of the web today. What would be ideal is to find a way for the discussions that do happen to be immediately visible somewhere. For example, what if, instead of having an anonymous reviewer write a review that only the paper's authors and journal editor ever sees, there was instead a facility for public review (either anonymous or not), visible at the same site where the paper exists, where the authors' replies are also visible, and where other interested people can add their views? The threat of peer review would still be there. If a paper was not written with care, people could add this in a review. This review would remain unless or until the paper was revised. Moreover, negative reviews that would hold up a paper could also be publicly seen. Then, if a reviewer makes unfair criticisms, or misunderstands a paper, the authors could makes this clear and the readers can judge who is correct. Or, even better, the readers can add to the discussion and perhaps enlighten both the authors and the reviewer (with words that all other readers can see)! In the last few weeks a disagreement has surfaced at the arXiv. The disagreement concerns whether backreaction is important in cosmology. To summarise my take on the whole thing, it seems to me that the two sides of this disagreement are, to a large extent, talking past each other. I don't doubt that there is genuine disagreement where definitions overlap, but, at least to my present understanding, much of the disagreement actually just lies in what should be considered "backreaction". There seems to be a secondary, though related, disagreement concerning whether one should start with observations and use them to methodically construct a model of the universe, or instead start with a model of the universe and then see whether it fits the data. The side that favours first constructing the model would say that a model without any backreaction is entirely self-consistent and fits the data well enough not to be concerned. To the other side this still doesn't prove that backreaction must be negligible. But OK, what is cosmological backreaction? Backreaction itself is quite a common term in physical sciences. In a surprising proportion of calculations about nature we would normally analyse some sort of interesting object, existing within some external system, but in a scenario where the behaviour of the object has no measurable influence on the overall system. Then, calculating predictions essentially amounts to two independent steps: firstly, calculating what the background system is doing, and then calculating how the interesting object will react to that. However, this type of scenario isn't always accurate. When it isn't, the background system could be described as "backreacting" to the object's behaviour. Early last week a news story broke about a supervoid. The supervoid was claimed to be a number of things, from an explanation for "the cold spot", to the biggest "structure" yet found in the universe, to just "mysterious". Whether it is a structure or not entirely depends on how you define structure, so I won't discuss whether it is or isn't a structure. However, if you do allow it to be a structure, it isn't the biggest structure yet found. It's hard to do a like for like comparison with other "superstructures". However, there are regions of the universe where the density of observable matter is smaller, for a wider range, so by any definition I can think of, this structure has been beaten. The cold spot is a region in the cosmic microwave background (CMB) that has a temperature profile that is somewhat unexpected (due to a combination of a cold central spot and a hot ring around it). Whether this void could be the explanation of the cold spot has been explained in this paper and this blog post by Sesh. It can't, not without a significant deviation from General Relativity (and a sufficiently big deviation that it would be very strange that these deviations haven't been seen elsewhere). It's worth stressing right now that it isn't the coldness of the cold spot that is itself anomalous. This is a subtle point so just about anyone who says "the cold spot is too cold" can be forgiven for the mistake, but in reality the cold spot isn't too cold. In fact it has more or less exactly the coldness expected of the coldest spot in the CMB. What isn't expected is that there will be a hot ring around such a cold spot. Actually, it's worth stressing further that it isn't even the hot ring that is, by itself, anomalous. Such a hot ring is also quite likely in the CMB. The anomalousness of the cold spot is caused by the fact that both of these features are present, right next to each other. I explained this curiosity in this blog entry, but it is worth repeating. I want to address now quickly the claim that this supervoid is mysterious. The quantitative source for the claim that the void is mysterious comes from the claim in the paper about the void that it is "at least a \(3.3 \sigma\) fluctuation" and that "\(p=0.007\) ... characterizing the cosmic rarity of the supervoid". However (and this is the crucial point) what these numbers quantify is the probability that something as extreme as this void could exist at a random point of the universe (or, more precisely, a random point within the part of the universe seen by a particular observational survey). What these numbers do not quantify is the probability that the whole survey could have seen something this extreme. These are two separate statistical things and the relevant one for claiming mysteriousness is the second one. I'll try to estimate this probability. I don't have any reason to doubt the numbers they quote for the probability that this void could exist at a random line of sight in the survey. If I use the quoted radius, density contrast and redshift of the void I also calculate it to be a \(\sim 3\sigma\) fluctuation in the matter field. This can be done first by calculating the root-mean-square of the density (contrast) field of the universe when it is smoothed over a particular radius. 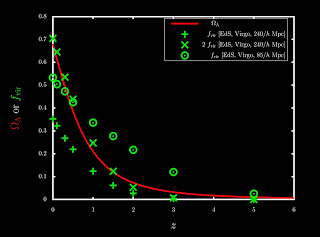 This quantity, "\(\sigma_R\)", is commonly used in large scale structure. Then, the ratio of the density (contrast) of the obtained void and the \(\sigma_R\) value for the radius of the void gives you \(\sim 3.5\) so I trust that the more sophisticated analyses in the paper are correct, or at least aren't obtaining wildly wrong answers. If one assumes (probably validly) that the large scale density field of the universe has a Gaussian distribution this can be translated into a probability that the observed fluctuation could occur at any random position in the universe. So, the crucial question that now needs to be asked before calling this supervoid mysterious is whether the survey used to find it saw enough of the universe to witness this rare an event. The size of the void in the sky is approximately \(10\) degrees (as quoted in their abstract). This means it has an area of approximately \(100\) square degrees on the sky. 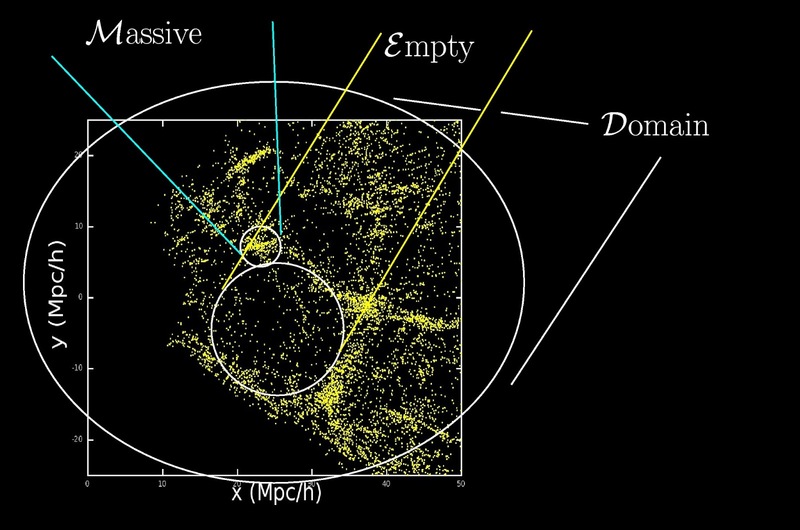 The void was found using data from the WISE and 2MASS all-sky surveys. However the whole sky isn't usable for robust analysis due to foregrounds, the galaxy, etc. Thankfully for our goal, the authors of the supervoid paper also wrote a paper about the catalogue of galaxies they used to find the supervoid and in the abstract of that paper they estimate that their catalogue covers 21,200 square degrees of the sky. What does this mean when we pull it all together? Well, the catalogue used to find the 100 square degree thing, covered 21,200 square degrees of the sky. Therefore, there were \(\sim 21200/100 \simeq 200\) independent \(100\) square degree patches of the sky seen by the survey. Using their own probability for this void existing at any particular line of sight of \(p=0.007\) this gives a very approximate estimate of the expected number of under-dense regions of the universe at least as extreme as the "mysterious" supervoid. The answer is \(N \sim 200*0.007 = 1.4\). So, not only is the supervoid not actually mysterious, it is in fact more or less exactly in line with naive expectations! Banner image: Étienne-Jules Marey, Chronophotograph of a gull in flight, 1887. Powered by Blogger.